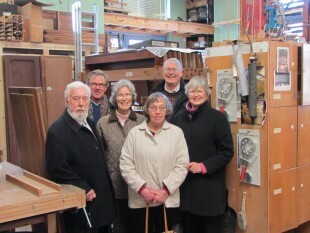 On March 30th we were visited by a group from Great Tew, the customers for our current project, the restoration of their ca1865 Henry Williams organ. It is a small two manual and pedal organ, very solidly and confidently made. From the left Charles Mould, Jeremy Treglown, Naomi Bowen, Ann Abbotts, Patrick Thomas and the Revd. Ginny Thomas. We are looking forward to returning the organ in the second half of May.